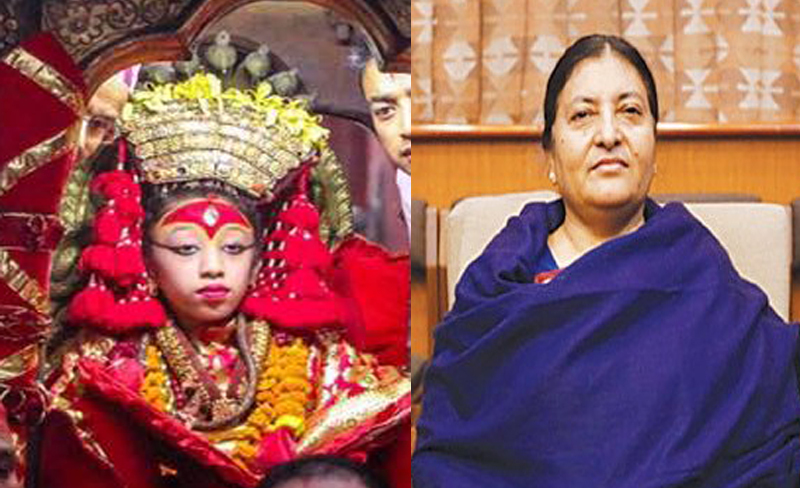 KATHMANDU, Sep 11: President Bidya Devi Bhandari on Sunday – the final day of the Indra Jatra festival – received blessings from the living Goddess Kumari. The President arrived at the Kumari Ghar at Basantapur where Kumari offered her flowers, Prasad (a food substance offered to Hindu deity and then consumed) and Tika (a paste of vermillion powder on forehead). It has been a tradition dating back to the ancient Malla era that the head of state visits the Kumari Ghar on the final day of Indra Jatra to receive blessings from the living Goddess. The Indra Jatra, which commenced on September 5 concluded on Sunday, after the Lingo – a wooden ceremonial pole – was toppled during the auspicious time at 10:45 pm accompanied with a worship ritual. The wooden pole brought from Chittapole jungle in Bhaktapur was erected to mark the begging of the Kathmandu's biggest festival by the local residents, Nepal Army and the Armed Police Force personnel. The members of the NA's Gurju Paltan fired cannons amidst a musical ceremony to mark the end of Indra Jatra. The Gurju Paltan performs the same ceremony to mark the begging of the festival after erecting the pole.